Facts about Fossils: How do fossils form? Where are they found? A fossil is the preserved remains or trace of a plant or animal from the past. That's the simple answer to "what is a fossil?" Plants can be preserved with a carbon film on a piece of shale, an animal bone can be naturally replaced by minerals and preserved, or a footprint in the sand can harden into a fossil. Fossils usually only form in sedimentary rock. Sediments have to accumulate over the organism in order to preserve it. Examples of rapid buiral include being quickly buried by sediments during a flood, a mudslide, volcanic eruption, or it could be sap from a tree oozing over an insect. Most fossils form in environments with water. 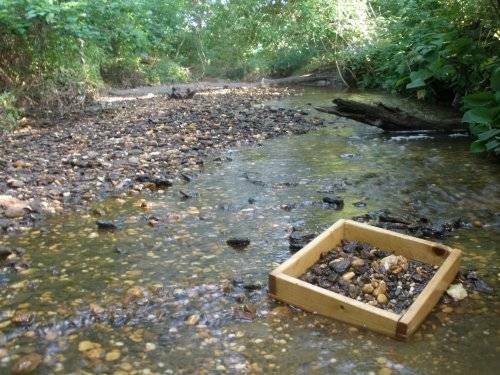 This is because sediments easily accumulate in water environments (lakes, streams, oceans). Land environments are usually the sites for erosion and not sediment deposition. Let's look at an example of a leaf falling into a river. The leaf falls into the river, floats downstream, and eventually sinks to the bottom. It is then covered by silt and sand over then next few days. As more time passes, more and more sediment covers it. Each layer of sediment increasingly protects the leaf from decay. Now, multiply the time frame by an unimaginable number of years.. millions of years. Instead of the leaf being buried by a few inches of sediment, it is buried by miles and miles of sediment! Something now begins to happen to that sediment. Under miles and miles of pressure it heats up and the leaf literally cooks. Only the carbon ash remains. Chemical processes start to occur under the tremendous pressure, and the sediments compact into a type of rock... sedimentary rock. Now, add millions of more years. Geologic forces thrust that sedimentary rock back onto the surface. Wind and weather take its toll. The sedimentary rock outcropping begins to erode away. In one of the pieces of the eroded rock outcropping falls a fossil leaf impression. That was the leaf that fell into a river millions of years ago. This is how fossils form. This wonderful animated gif below that has circulated around the web shows this process. Instead of a leaf, it uses a dinosaur. Animated gif of a dinosaur being fossilized. Preservation methods for fossils vary. Plants are fragile and often cook so that carbon only remains. Animal bones, teeth, and hard shelled animals are dense, and often have minerals leaching into them to replace the original bone. There are many ways an organism can become preserved as a fossil. 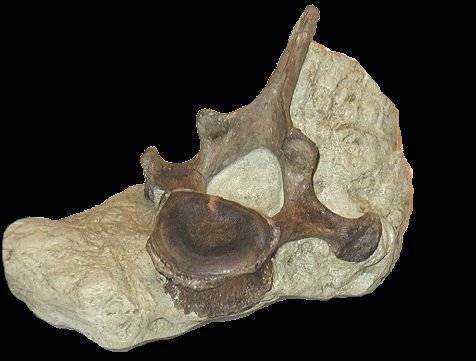 Some of the ways include Casts and Molds, Permineralization, Replacement, and Carbonization Sometimes the fossil is unaltered, meaning it is the actual organism. Fossil Turitella shells from the Potomac River. 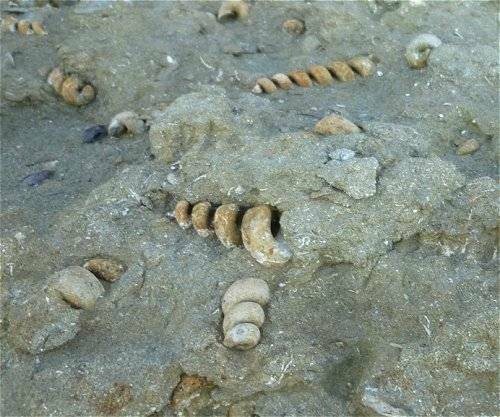 They have been preserved as Casts when sediment filled in the shells. When they pop out of the sedimentary rock, a mold is left. A cast and mold is created when an organism is buried and rots away. The empty hole where the organism was is filled in with sediments or minerals, that become a cast. The mold is the impression in the rock it left. This is like pouring chocolate into a mold. When the chocolate hardens, it pops out as a chocolate cast, ready to eat. Fossil shells are often casts, and shell impressions on rock are often molds. A fossilized footprint is a mold. Plant fossils and trilobites are often found as casts and molds. 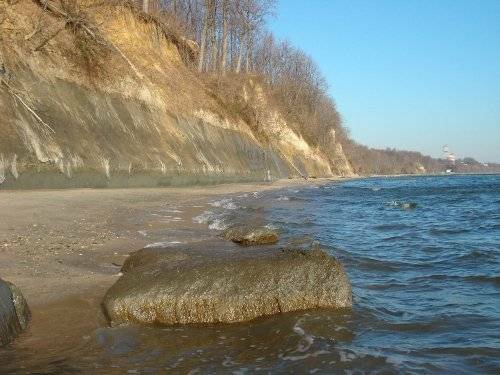 Calvert Cliffs of MD has been preserved through permineralization. The minerals that replaced it gives it a beautiful rusty-brown color. 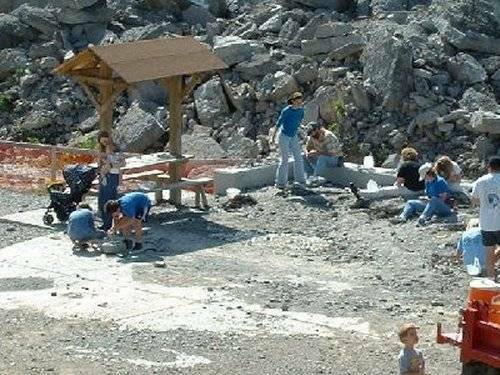 Permineralization is when the organism is buried in the ground, minerals from ground water seep into the organism and slowly fill in the pores in the animal, adding rock forming minerals to the hard parts of the animal. Replacement is similar, in that minerals seep into the organism. However, the minerals replace the original organic material, as the organic material rots away. In the end, the organism is replaced by minerals. Many fossils are preserved these ways, from Fossil Sharks Teeth, to Trilobites, to Bone. These plant fossils slabs from St. Clair were carbonized. However, through complicated oxidation and replacement reactions, the Pyrite replaced the carbon and then a white substance called Pyrophyllite replaced the Pyrite. Now the fossils have a white film instead of a black carbon film. Carbonization is the process where only the residual carbon of the organism remains. In nature this usually happens over time when the organism is subject to heat and pressure. A very common example of carbonization are fossil plants, where only a thin carbon layer is left on a piece of shale. 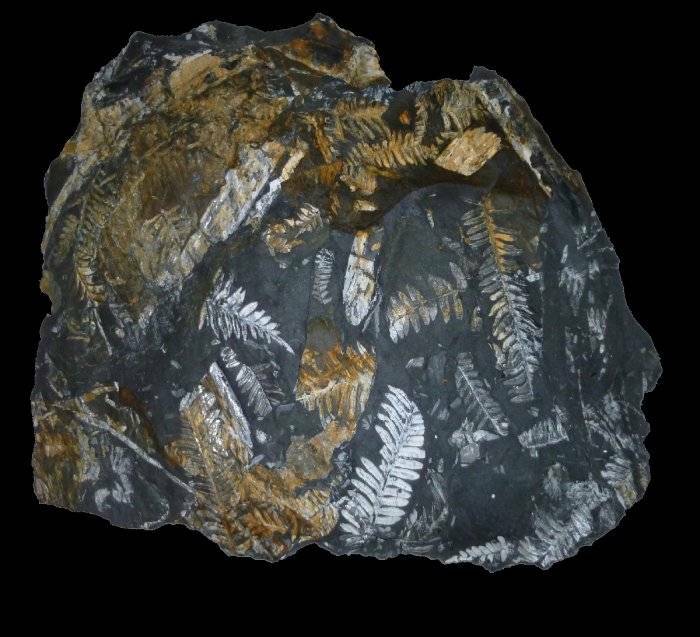 In the Carboniferous time period, fast fern forests created miles of carbon, which we mine today as coal. Another, more recent example is the fossilized feathers found on dinosaurs in China. These are left as carbon imprints in the shale around the mineralized dinosaur bones. It's important to note that most fossils are preserved by more than one mode. For example, the fossil leaves are carbonized, but also leave a cast and mold. Fossil ammonites are casts, however, they also are mineralized. Fossil trilobites are often found as casts and molds, but their exoskeletons are mineralized (usually replaced by calcite). 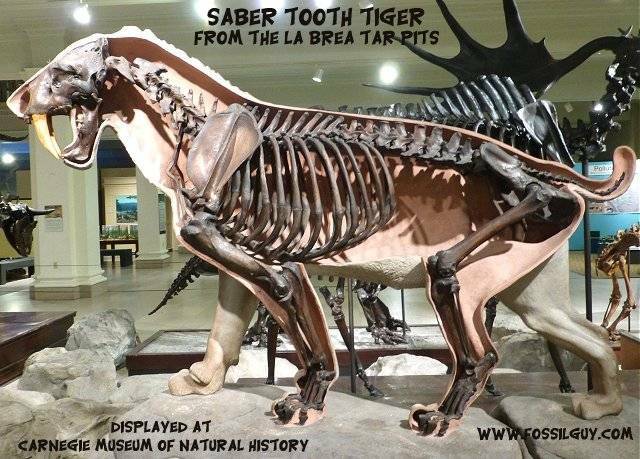 This is a fossil Saber Toothed Cat from the La Brea Tar Pits in Los Angeles. The skeleton is the original Unaltered Remains. The animal fell in the tar. The bones are original and are stained a brown color from the tar. An organism is considered unaltered if there is no change in the original composition of the organism. A famous example of this is found at the La Brae Tar Pits in Los Angeles. Here, Ice Age animals became trapped and sunk into the tar pits. The soft tissues rotted away, but the original bones still remain. Original bones from Saber Toothed Cats, Giant Ground Sloths, Short Faced Cave Bears, Dire Wolves, and many more strange creatures are all unaltered. Another example includes insects and small animals trapped in Amber. The sap from a once living tree entombed the animals. This sap eventually hardened, and the original animals are preseved inside the amber. A Trace Fossil, or an Ichnofossil, is a fossil not of an organism, but instead a fossil of an organisms activity. 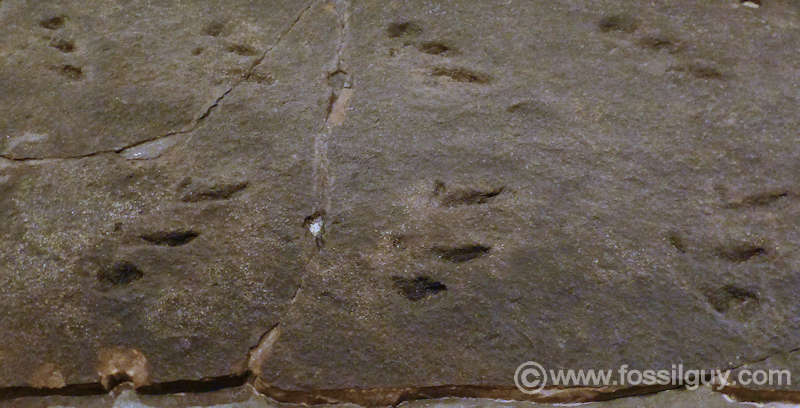 For example, a trace fossil can be a mold or cast of a footprint, or a cast of a fossil burrow. Animal borrows that have been filled in by sediment are very common in many sedimentary rock outcropps. 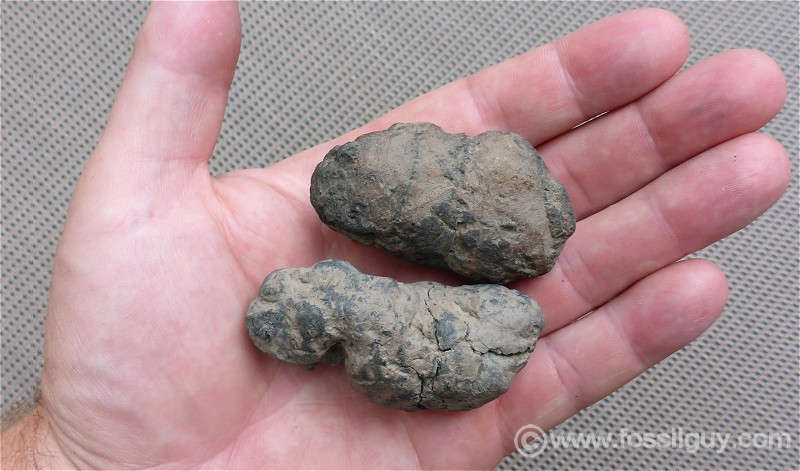 Coprolite, or Fossil Poop. Yes, even poop can fossilize. This is poop... Yes, Fossil Poop. Even poop can fossilize! A piece of fossil poop is called a Coprolite. Coprolite is classified as a Trace Fossil. These fossils can tell us all about the diet and ecology of the animal! The Coprolites pictured here are from from a cretaceous Super Crocodile. It takes a unique set of circumstances to preserve a fossil and then to re-expose it for us to find. Each fossil is a miracle. Fortunately, since there have been so many countless life forms over countless years, fossils are more common than you think. Most sedimentary rock outcroppings contain fossils. Fossils can be found in places opposite as how they form. 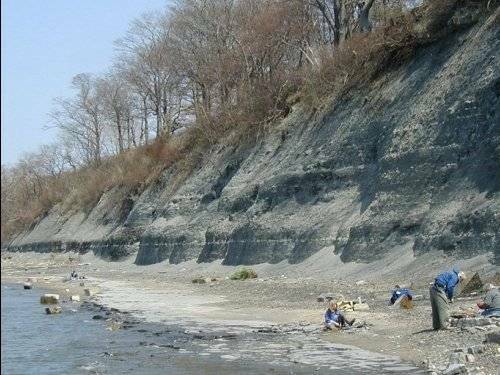 You want to look for fossils in places of erosion, where sediments do not accumulate, but instead erode away. 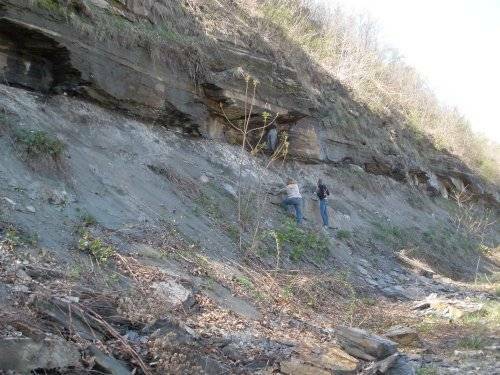 Also, to find fossils, you need to look in sedimentary rock outcroppings. Other types of rock, such as granite are not formed by sediments accumulating, so animals will not be preserved in them. Sedimentary rock includes sandstone, shale, mudstone, limestone, and clay. 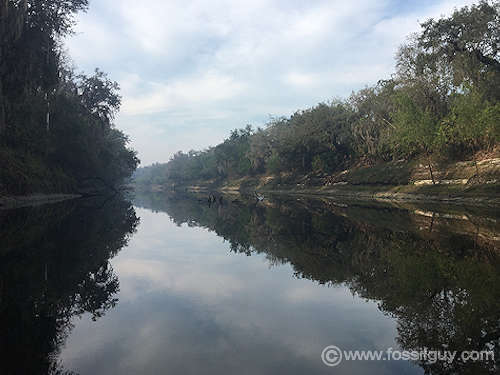 Included here are some well known places to find fossils.